I was so excited about putting my Chocolate Whipped Cream on strawberries that I never thought to put some in my coffee. Thankfully, I have smart friends. Earlier this week, I had 11 other women in my home for Bunco. (It was time for this Mama of boys to get some girl time!). I served BLT Wraps, veggies with Homemade Ranch Dip, chips and salsa, and Chocolate Whipped Cream on Strawberries. It was all simple to prepare and serve, which made it perfect for a fun night in with the ladies. While many of us were enjoying bowls of strawberries with Chocolate Whipped Cream, one of my friends took her full coffee cup over and scooped in some of the chocolaty goodness. It didn’t take long for several of the rest of us to follow her lead. Before I knew it, I was brewing another pot of coffee and making another triple batch of Chocolate Whipped Cream. Mmmmm, so good. In a bowl, whip the cream until soft peaks form. Add cocoa and stevia, and whip again for a few seconds until ingredients are mixed well. Serve on top of sliced strawberries…or coffee! Now, a few days later, as if I wasn’t already beginning an addiction to putting Chocolate Whipped Cream on my strawberries, now I’m adding it by the huge spoonful(s) to my coffee mug in the morning. Ahhhhmazing. And no guilt. It’s all real food, and there’s no sugar involved. If you don’t want chocolate, can I interest you in making Peppermint Cream for your coffee? And if you really want a sugar splurge, but you still want real ingredients, how about Homemade Chocolate Caramel Creamer? Listen everyone – with goodness like this to put in our coffee, why would we ever need to buy coffee creamers that are full of not-so-real ingredients? Why?? So what do you think will be your fav? Chocolate Whipped Cream in coffee…or on strawberries? And Vanilla with whipped cream is equally as good. Or caramel and chocolate. Or sometimes cinnamon. I just ran out of liquid stevia, but I have the heavy whipping cream and stevia on my grocery list because I am soooooooo making this! It sounds so yummy! This makes my “cooking gears” start spinning… wondering what other flavors could be made using this method. :-D Very cool. You heat 1 tsp gelatin in 4 tsp water until gelatin fully dissolves; let it cool. Then whip cream on low ’til soft peaks form; add cooled gelatin while continuing to whip cream; watch your cream thicken. This cream has stored very well for us at least a week and it was still thick; not runny as it can sometimes be without a stabilizer. Not that I’m not totally delighted to see this recipe, but thank you thank you thank you for linking to the recipe for the wraps! I was going to ask you about them tomorrow! I love the red mug! My mom used to always make chocolate whipped cream with angel food cake. It was amazing! If you don’t have any liquid stevia on hand, can other sweeteners be used – sucanat, honey, etc? That should work fine. I would just make sure to mix it really well so you don’t get a grainy texture. This is yummy! 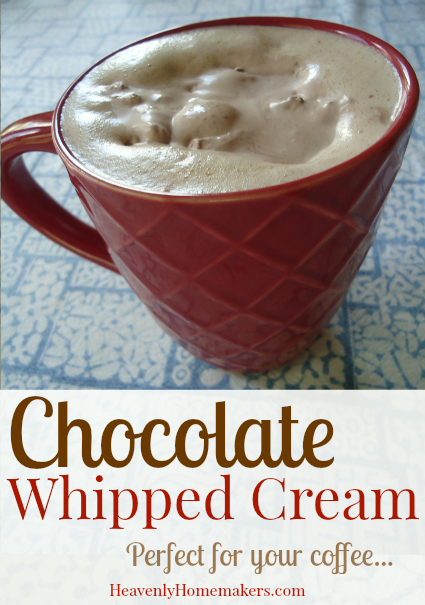 I hadn’t thought of making chocolate whipped cream before. If you have an immersion blender you can whip cream up in under a minute!